Gov. Walker holds up the bill after he signs it. The state is committing $3 billion, while the company is expected to invest $10 billion. Foxconn says it could create up to 13,000 jobs at the LCD screen plant. Trades people stood onstage with Gov. Walker at Monday's bill signing. “This is about ensuring that our children and our children’s children will have those kind of generational type of opportunities,” Walker said. In celebrating the bill’s success, Walker acknowledged it had a rough time in the Legislature. While most of Walker’s fellow Republicans see job creation and investment in the deal, most Democrats have a different take. They call the plan a huge corporate giveaway that doesn’t guarantee the people who need jobs the most will get them. And they’re troubled by the environmental rollbacks that are part of the incentives package. But Walker said he has confidence in Foxconn, and he believes the project will win over the critics. “The bottom line is every day this will become increasingly more popular as people see that they’ll follow through on their commitment,” he said. Walker laid out the next steps in the process. He said the Wisconsin Economic Development Corporation board still needs to approve the deal; it’s scheduled to meet next Thursday. 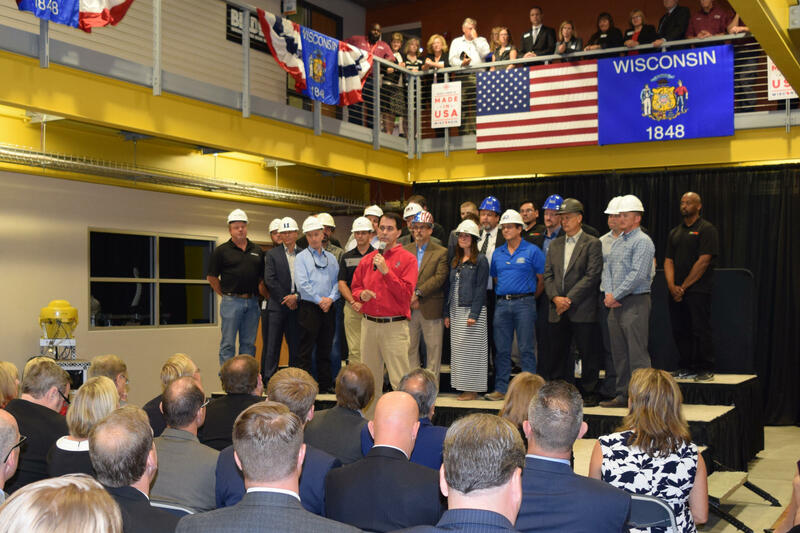 Then, the governor said Foxconn officials will be in Wisconsin a few days later to sign a contract with the state – and to announce exactly where the plant will be located. Walker said if all goes as planned, groundbreaking on the plant will take place next spring. Assembly Minority Leader Peter Barca of Kenosha was on hand for the bill signing. He’s one of a handful of Democrats who voted for the measure. While he supported it, Barca remains hopeful the package can be changed. He said language in the bill left open the possibility that the plan could be tweaked at the time the contract is signed. The current measure calls for taxpayers to recoup the losses from the $3 billion incentives package after 25 years. Barca said the state could shorten that time period, in the contract that it signs with Foxconn. “Our feeling all along was that Democrats had put forward motions to try to make it more like a 15 year deal, that the taxpayers would be made whole after 15 years, so as close as we can make it to a 15 year deal, the better for the taxpayers," he said. Meanwhile, some businesses also were represented at the bill signing...expecting they’ll develop a relationship with Foxconn. Milwaukee Bucks President Peter Feigin said he plans to contract with the company for items that will adorn the new Bucks arena. “We’re talking about the signage, the screens, the LED boards, the televisions themselves, all those things,” he said. Feigin also said he speaks regularly with Foxconn execs, who’ve also talked about sponsorships. He wouldn’t elaborate on whether that means Foxconn would put its name on the new arena. Governor Walker on Monday will sign legislation at Gateway Technical College in Sturtevant that provides around $3 billion in incentives to the Taiwanese company Foxconn. The company is expected to build a major manufacturing plant in Racine County. In its initial stages it is supposed to employ 3,000 people and could eventually ramp up to around 13,000.